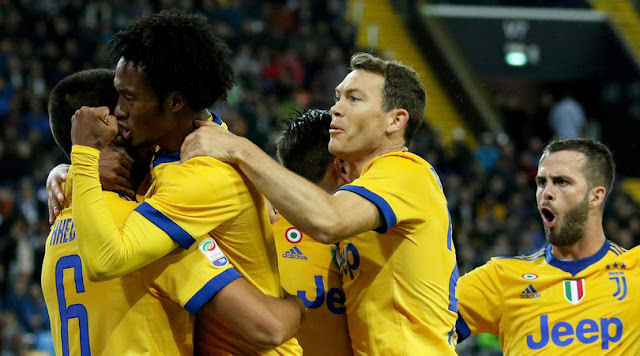 Sami Khedira grabbed a hat-trick as Serie A champions Juventus came from behind to thump Udinese 6-2 away on Sunday despite playing for more than an hour with 10 men. Big-spending AC Milan were also a man down before the half hour after captain Leonardo Bonucci was sent off for elbowing but their game ended very differently with a 0-0 draw at home to lowly Genoa. Hapless Benevento became the first side in Serie A history to lose their first nine games of the season as they were sunk 3-0 at home by Fiorentina while AS Roma recorded their 11th successive away league win, 1-0 at Torino. Juve, who had taken one point from their previous two games, went behind to a Stipe Perica goal after eight minutes. The champions quickly hit back as Udinese’s Samir headed a corner into his own net in the 14th minute and Khedira headed the visitors ahead after 20 minutes. Five minutes later, Juve forward Mario Mandzukic was booked for clashing with Ali Adnan, then insulted the referee and was immediately sent off. Juve appeared to be on the rack when Danilo equalised for Udinese in the 48th minute but instead Daniele Rugani headed them back in front four minutes later. That opened the floodgates, with Khedira scoring twice more before Miralem Pjanic completed the rout to leave third-placed Juventus three points behind leaders Napoli and one behind Inter Milan. AC Milan, who were jeered off by their own fans after their stalemate, dropped to 11th with 13 points from nine games despite having spent more than 200 million euros ($235.66 million) in the transfer market in the summer. Milan were already struggling to break down Genoa when Bonucci lashed out at Aleandro Rosi with his elbow at a Milan corner, leaving the Genoa player with a deep cut on his face and needing treatment which took several minutes. During that time the referee consulted the video replay and showed Bonucci the red card. To their credit, Milan continued to take the match to Genoa even after they were a man down, creating numerous openings, and their spirited performance could just be enough to save Montella. But it could also have been much worse for the hosts if Genoa, who have six points, had taken one of several chances at the other end. Roma moved up to fifth on 18 points after Aleksandar Kolarov scored with a 25-metre free kick in the 69th minute. Marco Benassi, Khouma Babacar and Cyril Thereau, with a penalty, scored Fiorentina’s goals as they added to bottom club Benevento’s misery. Chievo came from behind to beat 10-man Verona 3-2 in their derby, with Sergio Pellisier scoring the winner in the 73rd minute after Roberto Inglese had grabbed a first-half brace. Verona’s Argentina midfielder Bruno Zuculini had a miserable afternoon, as he was booked for giving away the free kick which led to Inglese’s first goal, conceded the penalty which led to his second and was sent off seven minutes before halftime. Sassuolo won 1-0 at SPAL despite missing a penalty and having a player sent off. Matteo Politano scored after 45 seconds for Sassuolo before Domenico Berardi missed a late penalty and Francesco Cassata was dismissed for a late tackle just three minutes after coming on for his Serie A debut.